My husband isn’t a huge fan of frosted cake so I try to find something a little different each year for his birthday celebration. 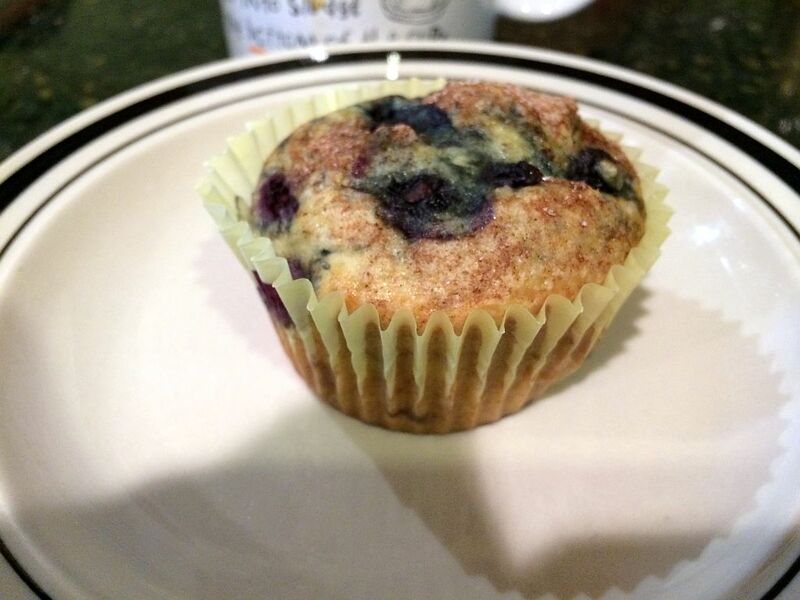 This year I hit upon a blueberry muffin-like creation. Inspiration came from a blueberry crumb cake recipe. Wanting something (slightly) lighter than the uber-buttery crumb cake I left out the crumb topping and opted for a sprinkle of sugar and spice. Position the baking rack in the center of the oven. Preheat oven to 350°F. Line 2 12-cup cupcake pans with paper liners. Add 1/4 cup sugar, the cinnamon, all-spice and a pince of salt to a small bowl and mix until thoroughly combined. Set aside. Sift together the flour, baking soda and powder and remaining 1/4 teaspoon of salt. Set aside. Combine the butter and remaining 1 cup of sugar in the bowl of stand mixer. Mix for 1 minute on low to bring the ingredients together and then beat for 2-3 minutes until light and airy. Add the eggs, one at a time, mixing to combine after each additional. Add the vanilla and sour cream; again mixing to combine. Gradually add the flour mixture to the batter and mix until just combined. Remove the mixing bowl from the mixer and fold in the frozen blueberries. Use a disher to fill the cupcake liners. Sprinkle each cupcake with about 1/3 teaspoon of the cinnamon-allspice-sugar mixture. Bake both cupcake pans on the same baking rack for 30 minutes; rotating pans (and swapping sides) half way through. Test for doneness with a toothpick; it should come out clean with no crumbs or batter sticking to it. A little blue from a errant blueberry is certainly possible but not a concern. Cool for ~15 minutes on racks. Remove from the cupcake pans and enjoy. A disher, such as one of these, makes cupcake, muffin, cookie and pancake prep so much easier. This recipe is adapted from Martha Stewart’s Classic Blueberry Crumb Cake. I’ve been making these for 5 years or so. I started with a recipe from Taste of Home and have made enough scribbles on that printout that it seems like a good idea to capture them less I toss the paper and lose all of the work. We usually serve these with a baked rice and green salad. A little extra sour cream on the the side never hurt anything. Preheat oven to 350°F. You’ll need 2 13″x9″ glass baking dishes. Combine tomato sauce, water, chili powder, paprika, cumin and oregano in a saucepan. Add a generous pinch of salt and 10 grinds of black pepper. Stir to combine. Heat to boiling and cook, uncovered, for 5-10 minutes until slightly thickened. Microwave the chopped onion for 2 minutes on high. Allow to cool for 10 minutes. In a large bowl combine sour cream, cilantro, 2 cups Monterey Jack cheese, cheddar cheese, 1/2 teaspoon kosher salt and 20 grinds of black pepper. Add the onions once they have cooled. Mix well. Place 1/2 cup of sauce in the 2 baking dishes, spreading to evenly coat the bottom of each pan. Wrap 4 tortillas in a paper towel and microwave them for 45 seconds on high. Working one tortilla at a time spread 2 tablespoons of sauce on one side like a pizza, add ~1/3 cup of cheese filling in the center and fold into a tube. Place, seam side down, into a baking dish.. Repeat the process, warming more tortillas as needed. Pour a generous cup or more of the sauce over the completed enchiladas. Bake, uncovered, for 20 minutes. Sprinkle the remaining 2 cups over cheese over the 2 dishes and cook for another 5 minutes or until the cheese is melted and bubbly. I usually make the sauce and the filling in advance so that I’m left with an assembly job just before putting these in the oven. If you fill and sauce the tortillas too far in advance the dish will turn into a tasty amorphous blob. I use packaged shredded cheese to save time. Feel free to use a block of cheese and hand shred it. The cheese inside the enchiladas may melt a bit more by doing that. Microwave the onions helps to avoid a raw onion taste in the enchilada. If you like the flavor of raw onions then just add the chopped onions to the filling mix. Leftover sauce can be cooled and frozen for up to 3 months. It’s a nice sauce for a frittata or grilled meat. A long overnight upgrade for work didn’t take nearly as long as expected so I was back at the helm of the Saturday night cookery this week. Our friend with a dislike for cheese and cilantro wasn’t joining us and Ted had been hinting at enchiladas for months. Sometimes you want to take a humble vegetable and amp up the flavor. This side dish comes together quickly and you’ll be wowed by the intense flavor a little saffron will bring to the party. This recipe is based on one from Chef Ana Sortun. Soak the saffron in the 1/3 cup of water for at least 15 minutes. Combine the cinnamon and sugar in a small bowl. Heat oil in a 12″ skillet over medium heat. Add the carrots and toss in the heated oil to coat. Add the cinnamon sugar mixture, garlic, pinch of salt and 10 grinds of pepper. Stir to coat evenly. Add the saffron water. Reduce heat to medium-low and cook for approx. another 6 minutes. The water should be absorbed by the carrots and they should become lightly glazed. Add the lemon juice, toss to coat and serve. I returned from Las Vegas late Friday night. I wasn’t terribly awake between the long flights and jet lag so Ted created the menu this week and did the bulk of the cooking this week. It was a tasty meal. Several years ago we subscribed to a CSA and received baby bok choy for several weeks in a row. I happened across this recipe in a magazine at the doctor’s office and gave it a try. It was a hit with a hint of garlic coming across under the lemon/sherry “dressing”. Preheat oven to 450°F. In a bowl toss the bok choy leaves, oil, garlic and salt until the oil and garlic are evenly distributed. Combine lemon zest and juice, tarragon, and sherry in a small bowl. Set aside. Transfer bok choy to a rimmed baking pan and place on the lowest rack of the oven. Cook for 2-3 minutes and then give the bok choy a toss with a spatula. Cook for another 2-3 minutes; Bok choy is done when the leaves are wilted yet still crisp. Drizzle lemon/tarragon/sherry over the bok choy and serve. Some weeks menu creation is more effort than others. I didn’t even have a vague idea of what I wanted to make until I grabbed a few cookbooks and went in search of a bok choy recipe I remembered making once before.